No sound on this or on “The Great Pumpkin” app. Tried ALL of the troubleshooting tips - none worked. Accidentally deleted Great Pumpkin trying to fix it. Bought this, Great Pumpkin, and Thanksgiving last year and they all worked. I want to use them in my classroom and I can’t now. I also want Great Pumpkin back, free of charge. Bought this years ago and loved it. Very well done and remains well supported (with bonus stickers!). Since the update I am unable to hear the sound on my iPhone 7+. Please fix it. 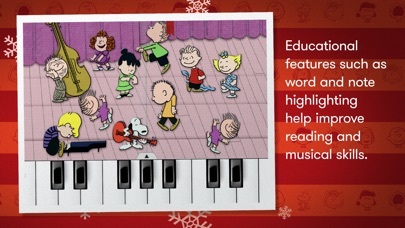 I’ve always enjoyed Charlie Brown. I like the app. I just can’t find the stickers that I’m suppose to be able to send to people. I also don’t have sound. I got this app for free from one of those monthly Starbucks freebies in the store, I grabbed the little card and installed it. I had no idea how expensive this app was let alone how amazing it would be. 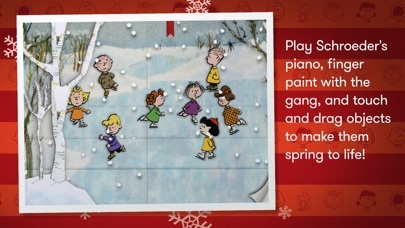 I reinstall it every year around the holidays because I love Charlie Brown and the Christmas story! I absolutely love it! The update is wonderful! Thank you!! Sadly the app of the day doesn’t work. Cute app and stickers. However, considering it's $5, it would be great if the app were updated for modern iOS versions and devices. The story book app crashes without fail on iOS 11 on an iPhone X. Simply try to pull down the red bookmark tab and the app should hang and crash. (App is also not formatted for iPhone X real estate obviously.) Works fine on iOS 10 on iPhone 7 and iPad Pro however. I bought this app when my son was 2. He enjoyed the music and moving characters. Now he can read and every year we return to this story. Perfect. Thank you Mr. Schultz. I love these stickers and use them all year round. 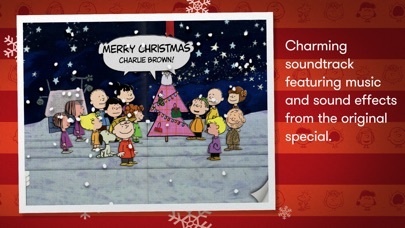 But I want more Charlie Brown! Please expand the pack or add more soon. I love this app, probably one of my favorites. The only problem is I cannot find one of the hidden ornaments! I’ve been through the pages countless times, tapped on everything I could see, and still cannot find the little football ornament with the hint “maybe Lucy can give you some advice”. Someone help! Otherwise, no complaints. The visual effects, the narration and the music are all great! My kids love this app too! This is a great book for kids who read, are learning to read, and cannot read. Thank you!!! Please update for new iOS. I love this app, but with no audio it's pretty useless. Fix it and it’s 5 stars! A GREAT REMINDER OF WHAT CHRISTMAS IS ALL ABOUT!!!!! I’ll give a higher rating when I can find some instructions and support. Is there something in the app I am missing? I love all of the special interaction and hidden items. Can't get rid of stickers...!! I love the original cartoon and have bought this app before. 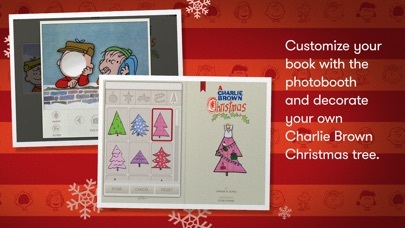 I first bought it two years ago, then I removed it because I didn't want a Christmas app on my phone all year long. When I went to put it back on the next year, I had to buy it again. Looks like I have to buy it again...not gonna happen. I'm not a sucker, and how greedy are you people!?! Very entertaining App. Each page has diff things you can do and it highlights the words while it reads it to your kids. Money well spent. This is a fantastic app. It's all the beautiful of the television special with some interaction. I really enjoy the interaction and the great graphics! I also had problems with the audio but their support page easily helped rectify the issue. Thanks for this wonderful app! A great American classic. Worth having! I can't believe it is 50 years old. Fun little app. Great way to tell a classic story. Really, really a nice job and works well with iOS 9. App does not work! No sound and touch screen sensitivity does not line up with icon you're trying to touch. Wasn't even able to look through the book due to that mess. I can't believe they're scamming people out of $6 for this. Again, DOES NOT WORK, SAVE MONEY! Love this app! I got this app for myself as little Christmas gift. This is a really lovely app. So much to do and see. With the update, you also get adorable animated stickers for iMessage, (only 1 is actually a Christmas sticker, but that's nice for the rest of the year). Highly recommend!!! I bought this for me. This is my favorite Christmas cartoon. I like that the book is from the cartoon. Great app. Brings back memories. 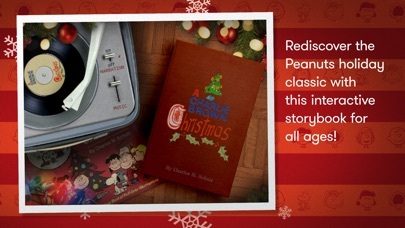 I have always loved A Charlie Brown Christmas and now I can share the story with my son. He loves the animation and the way it feels like he is turning the pages of a book. I like the narration because he can read it without me if he wants. Thanks for the creative way you have delivered the story to a new generation. This is quite simply one of the most inspiring children's stories I've read/seen. I love that it portrays the true meaning of Christmas. :) It really gives me so much hope for future generations. The book and graphics is great but... there is no sound...! My grand daughter loves this book! It is beautifully done. This App is Fun Year-Round! My kids and I love this story and the developers couldn't have done better with the app! If you're contemplating buying it, I strongly encourage you to do so. It's definitely worth the money! I thank the person(s) who created this app! It took me back to when my two children were little. As a family, the four of us watched the animated movie every time it came on television. Now they are grown, and one of them has a little boy. Even though our grandson is a toddler, I think he will enjoy the app. Let's face it, I downloaded the app for my enjoyment as well! 😊 Would have given it five stars, but the app crashed a couple of times. Cannot download stickers. It is not user friendly. Nothing on website provides insight for the sticker download.